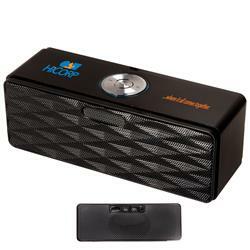 Bluetooth (R) Mini-Boom Speaker/FM Radio - a great promotional bluetooth speaker system. Aluminum case speaker/FM scan radio with steel mesh cover and no-slip bottom. Connects to your mobile device using wireless Bluetooth (R) technology or through the USB cord provided. Also play MP3 files through a USB flash drive or TF card. Included rechargeable lithium-ion battery that charges through USB port. 3.5 mm headphone jack. Black. Lifetime Guarantee. Supplier is QCA certified. RUSH AVAILABLE! Production Times Available: 5 working days standard. FREE 24 HOUR RUSH. SAME DAY RUSH AVAILABLE - PLEASE INQUIRE. 20 pieces per carton, 22.00 lbs per carton, carton size 8.00" x 14.00" x 12.00"